Alaska was the vacation of a life time. The memories made on this two week vacation will be some I will never, ever forget. Our first full day in Talkeetna Alaska we woke up to bright Alaska sunshine reflecting off of one million mosquitoes. Jenny made us some fluffy yet crispy pancakes, and Steven fried up some bacon. With mugs of steaming coffee in our sock covered hands Ryan and I braved the ‘sqitos and sat out on the porch in the sunshine enjoying the crisp Alaska morning air. Ow! Slap! Slurp. Ow! Slap! It may seem like I’m exaggerating but the Alaska mosquitoes are so bad I have seen a grown man cry from their persistence. 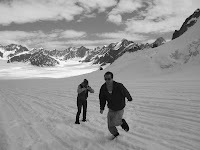 Snow ball fight on a glacier! “Should we just have our coffee inside? I’ve got two dead mosquitoes in my coffee and four new bites! And it’s only ten o clock!” I screamed over the constant buzzing in my ears. After finishing our breakfast we jumped in the Ford Focus rental car and drove into town. The day was gorgeous in the valley, blue skies, and dew in the air and on the plants from last nights thunder storm. In town we parked at Talkeetna Air Taxi and approached a bush plane. It was tiny. This small steel plane seats seven people including the pilot and exactly one smelly hippie. We took off from the air strip and flew towards Mt McKinley. The air got colder and the clouds increased as we neared the mountain. Looking down the water that we saw in the cracks of the glacier was almost neon blue. It was dazzling in the morning light. Our plane landed on Ruth Glacier, one of four glaciers near Mt McKinley. Of course when we got out of the plane we had to have a snow ball fight. 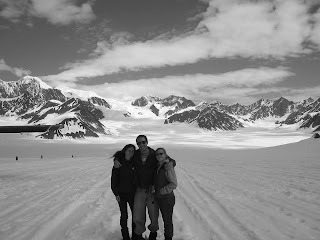 It’s really awe inspiring to actually stand on a glacier. And then hurl a crisp packed snowball at your best friend. The views returning to the valley were incredible. You could see all across the valley, and all the rivers snaking across the horizon. 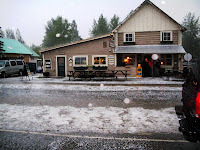 As we flew back towards Talkeetna we all were getting hungry and thought we would try the pizza place in town for lunch. 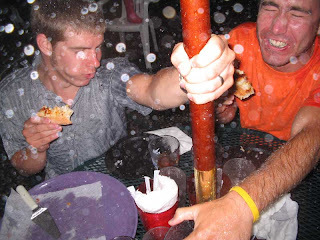 Mountain High Pizza Pie would turn out to be some of the best pizza we would ever have. 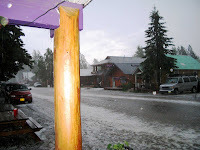 When we landed in Talkeetna the weather was perfect, about eighty degrees and with just a light breeze, we hoped enough to scare away the ‘squitos. We thought we would try braving them and sitting outside. We ordered a pitcher of Alaskan Summer Ale and sat back with some artichoke packed calzones. They were phenomenal. Every part of the meal was so good. The crust on the pizza was perfectly backed to a buttery brown and it paired perfect with the crisp cold beer. It was a perfect afternoon. The pizza was so good that the next night, well we all wanted pizza again. I was the DD that night at about six o clock we headed back out to Mountain High Pizza Pie. There was once again, a slight breeze so we thought we would sit outside and enjoy the sunny Alaska evening. We ordered some pizzas and a few pitchers of amazing Alaskan beer. As we enjoyed our meal, the sky started to darken. Within a few minutes a few rain drops appeared. 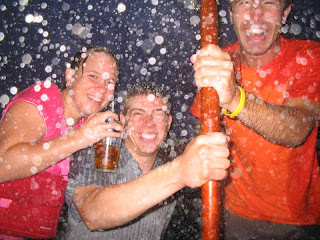 Then the sky opened up completely and it was pouring, pouring gallons of rain! 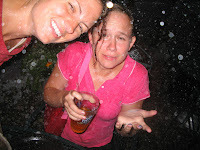 Then the hail started! And the winds picked up! But the pizza was so good! We didn’t want to waste it! Once in a lifetime pizza! So as the rain smacked us in the face and the hail pelted us we shoved pizza down our throats and tried to finish the beer, all the time laughing uncontrollably! The moment was so hilarious! 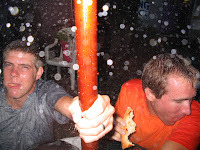 We were shoving pizza in our mouth as fast as we could, as the huge hail pellets pelted us! I actually had bruises the next day from the hail! This moment was so Alaska! 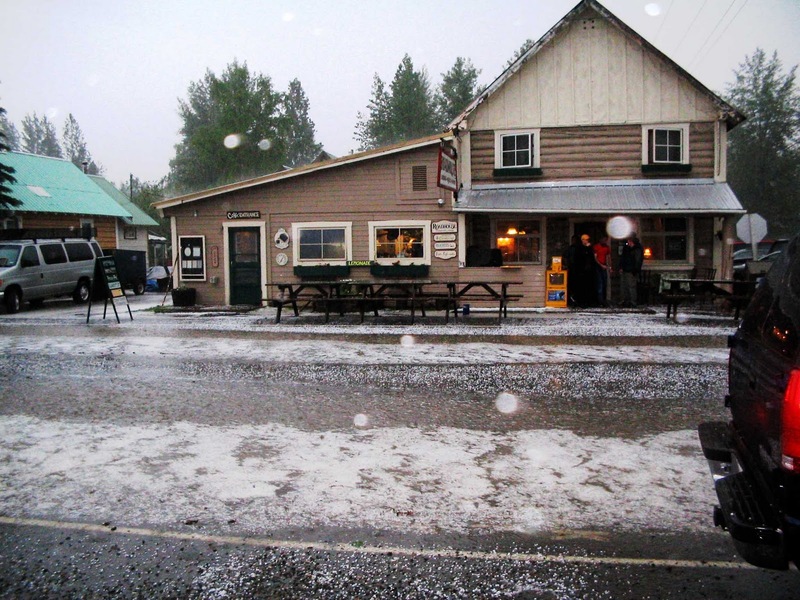 Only in Alaska would you get a storm this severe! 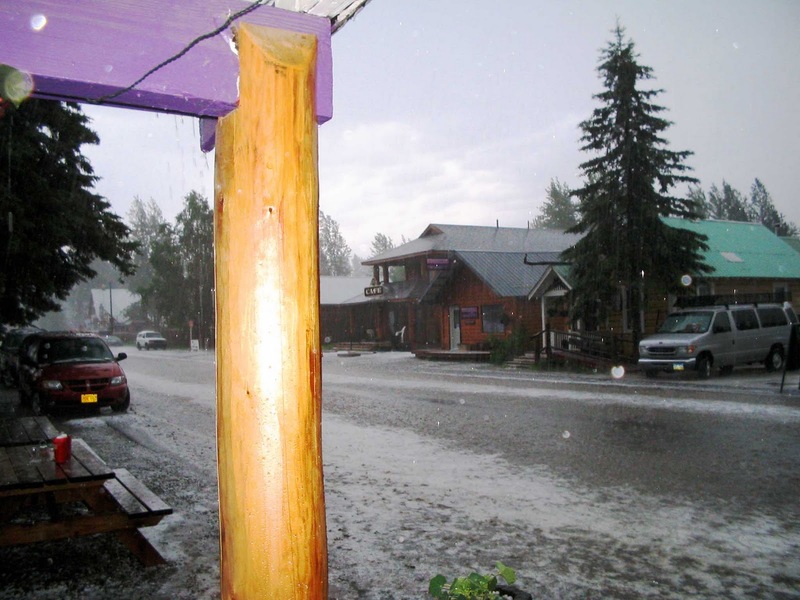 When I think back to 2007 and my Alaska vacation this hail storm was one of the absolute best memories of that trip. Actually this hail storm experience was one of my best memories of my very best friends and one of the times we have laughed the loudest having adventures together. It is hard to explain Alaska memories to people. The times we had were just so epic, unexpected and surreal. 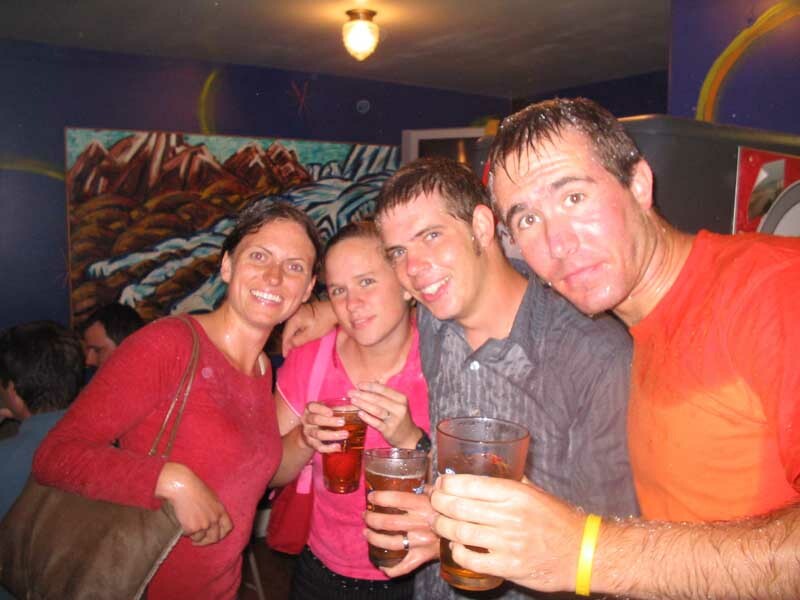 How I Fell in Love with Alaska, Mosquito’s and All…. That sounds like such an awesome experience. Makes me want to take my children to Alaska before they all leave the nest. You’ve made me want to go to Alaska just for the pizza! What a great story! Alaska is such a beautiful state–thanks for reminding me!